The Your Windows system is damaged support scam is a browser based scam that pretends that your Windows operating system is damaged and then prompts you to click on an “Update” button. This button will just bring you to another site that promptes scammy and unwanted software. When the “Your Windows system is damaged” Scam is displayed in your browser it will contain text similar to the following. Important: Click on the “Update” button to install the latest software to scan and prevent your files from being deleted. Unfortunately, browser based support screens make it difficult to close the screen or sometimes even the browser itself. Thankfully, almost all browser based tech support scams can be closed by opening Windows Task Manager and ending the browser process. It is important, though, that if you end the browser process that you do not reopen previously closed sites if prompted by the browser when you start it again. Finally, while standard site advertisements may display browser tech support scams, they are also commonly used by adware programs. Therefore, if you are constantly seeing browser based tech support scams, you should perform a scan of your computer for adware. Why am I Seeing the Your Windows system is damaged Tech Support Scam? 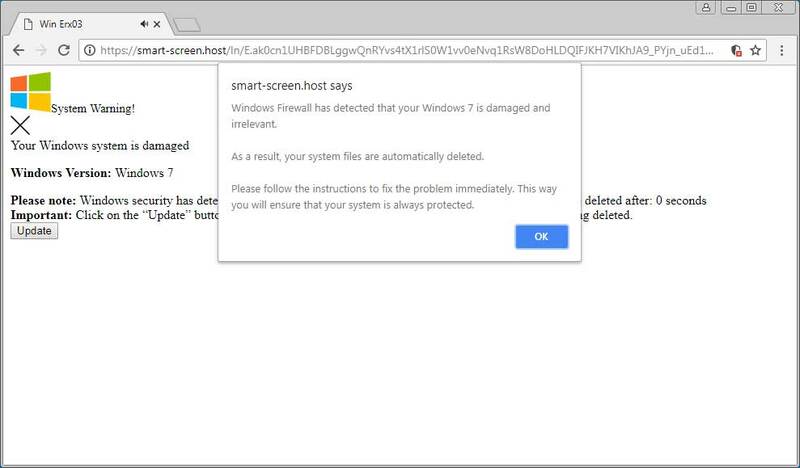 The Your Windows system is damaged scam is shown through advertisements that redirect you to sites that display this scam. These advertisements can be displayed by installed adware programs or through less than reputable sites that are displaying them to generate advertising revenue. For the most part, if you see a browser based tech support scam, then you can simply close the browser and start it again. On the other hand, if you are continuously seeing scams like the “Your Windows system is damaged” scam, then you should scan your computer for adware and remove anything that is found. Your computer should now be free of the Your Windows System is Damaged Scam program. If your current security solution allowed this program on your computer, you may want to consider purchasing the full-featured version of Zemana AntiMalware to protect against these types of threats in the future.